Reading Minding Movies reminded me of two books likewise made of shortish essays loosely grouped together, Mythologies (1973) by Roland Barthes and Minima Moralia (1974) by Theodor Adorno. All three are books of observations, interpretations, asides, reviews, and meta-commentary. They each work by accretion and juxtaposition. They usually start from something concrete and move towards broader generalization and reflection. In Minding Movies it is the stuff of cinema: here a film, there a camera technique as in the ‘unsteadicam’, an issue (sequels), box office figures, a foolish assertion like the assumption that all movies will soon be available on line, an interest in animation and Variety speak, or a frustration with the all too pat formulas of film reviewing. Readers will find Minding Movies a much more open-ended, multiple entry point kind of work than Bordwell and Thompson’s (B&T) previous studies. It can be dipped in and out of and read in any particular order. Each of the 31 essays are stand-alone. All first appeared in – and are still available as – blogs at www.davidbordwell.net. The essays are grouped into six themes: ‘The Business’, ‘Writing about Movies’, ‘Film as Art’, ‘Storytelling and Style’, ‘Films’ and ‘Into the Future’. In this case at least, blogs are leading to books; and books become selections from blogs! If B&T’s previous work has been concerned with an issue, a problem, or some aspect of filmmaking which is then explored rigorously and exhaustively bracketing out other considerations (who can forget Bordwell counting blinking in Jerry McGuire in Figures traced in Light! ), in this book B&T focus on anything to do with the cinema under the one cover. Because they do not segment and divide an issue into manageable bits to be explored in depth through their hypotheses and rigorous investigations, it is hard to lay at Minding Movie’s door the standard criticisms of B&T. This is a book of essays meditating on the cinema in its diverse aspects. It is not too ‘scientistic’, mechanical, bloodless, formalist … etc. Perhaps this book might serve to qualify some entrenched estimations of B&T. In being prepared to address just about anything and in any order, Minding Movies has an improvised, occasioned and curiously appealing quality. Its digressive and essayistic qualities provide a fresh take on B&T’s thinking about, positioning, and discussion of movies. These essays show B&T’s decades of cinema viewing, their cinephile enthusiasms as well as their restless analytical imagination. The 31 essays bring together in the one place what they have normally kept separate in their different books and different projects. They address films in several respects. They show their knowledge of the industry, of exhibition and distribution, and of the rhythms of the film world’s promotion and publicity, release and film festival cycles. Minding Movies is then a variation on the B&T ‘brand’. More than any of their previous books it gives a sense of what it feels like to view and think about movies and their social place in the way they do. The blogs yield a sense of two writer-critic voices whose cinephilia is both inescapable and infectious. The reader gets a cumulative sense of the place they occupy on both film scholarly and film industry horizons (including their influence on Hollywood scriptwriting manuals). It comes across as a surprisingly commodious place. Minding Movies, for this reason, may well generate further interest in B&T’s other titles by providing a way into them – a key to unlock them via their persona as critics with a particular sort of professional ethics, practice and felt set of responsibilities to their work and to the broader film milieu. Try to become an intellectual. Read history, politics, and the sciences. Study art history, music history, theatre, and literature. With a sense of the heritage of world culture, you might develop ideas and opinions that would shed light on film. (67). Perhaps the problem screen studies and media and cultural studies have had with B&T has not been as much with what the authors have brought to bear on their research as with its purpose. Minding Movies makes it clear the ends to which this scholarship and these inquiries are put is an historical poetics of the cinema. Their commitments seem to be the problem. These are to a generalised film as art, to filmmakers as artists, and to a film milieu broadly conceived. Unlike many previous scholars – think of Raymond Durgnat and Hitchcock and Renoir, Thomas Elsaesser and New German and Contemporary European Cinema, Sam Rohdie and Pasolini and Antonioni – B&T are not primarily associated with a ‘project’ in cinema or with a contemporary cinematic movement. Rather they are associated with a movement of criticism, and an approach to the cinema in its diverse manifestations. Like the art historian, B&T are interested in the art work and the art salon, art movements and style, the nature and consequence for the art work of the materials and techniques used, and the historically changing evaluations of these moves by critics and filmmakers alike. Like the art historian they are interested in the conjunction of an historical aesthetics of the art work and the formation of the particular art worlds which facilitate a range of aesthetic choices. This is what makes them interested not only in the relation between films made at different times and in different traditions but in the relation between film and other art forms. It also makes them alert to the diverging and converging systems of patronage and display: exhibition, distribution and production (including its financing!). Bordwell’s advice to the would be critic is not surprising although for those of us who see screen studies as a disciplinary field, the implied criticism of our field is obvious. How might this book (and the blogs upon which it is based), be taken up? At one level Minding Movies might be seen as an index of the growing contemporary re-engagement with questions of aesthetics and the nature, character and philosophy of criticism (as in Noël Carroll’s On Criticism 2009). Clearly Bordwell’s return to Munroe Beardsley to lay out “the four activities that constitute criticism” (54) echo Carroll’s broader concerns. This seems to presage a re-consideration of long traditions of aesthetic theorization and commentary with respect to film and a renewed attention to film criticism and its purposes. But equally, as Clayton and Klevan’s recent edited collection The Language and Style of Film Criticism (2011) shows, the task of defining a new vision for film criticism and cinephilia might entail an explicit stance against B&T. Clayton in the first chapter of their book, for instance, constitute B&T as exemplars of what criticism should not be, what it should not do, down to which expressions it should not use. Minding Movies will no doubt aid both uptakes. And, of course, Minding Movies would not be a B&T book without a perennial tilting against ‘critique’ – evident in their acknowledged abhorrence of cultural studies and Foucault, their critique of Grand Theory and their eschewal of the routine moves of film-society connections present in everything from ‘lazy’ journalism and review to cultural studies. No doubt their trenchant criticisms will confirm estimations of B&T’s apolitical and limited character and their commitments in Minding Movies to film as art will seem old fashioned and socially and politically disengaged. B&T do not evidence save in a mooted way the broader political, cultural and identity commitments that they have. Some of their criticism of theory and cultural studies is accurate but a lot is misleading. If I have a criticism of this book it is here: these criticisms have become too pat and too unexamined. B&T could learn from Ian Hunter’s reprise using Foucault of the ‘history of theory’. They could learn that there is another Foucault closer to many of their interests in, for instance, the Ian Hacking of Social Construction of What? And they could recognize the diverse forms cultural studies, in its dual form of cultural criticism and cultural history, now take. If these two familiar disciplinary takes on B&T were all to the matter the book would not be as interesting. 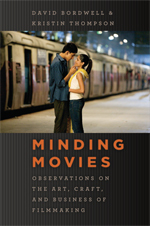 For Minding Movies is also part of another movement of criticism connected with the book and the blogs upon which it is based. This is a film criticism for a broader public brought to movies and to film writing by the internet and general film publications like Minding Movies. While the consequences of this space and its activities for the disciplinary engagements of screen and cultural studies are unclear what is clear is that neither screen studies nor cultural studies has any monopoly on public intellectual approaches to films and film criticism. The internet is fueling renewed debate and interest in film as art and the work of film criticism – often under the guise of ‘cinephilia’ which takes the form of a kind of social movement. In this context the B&T of Minding Movies are gaining new readers and new support not only from influential critics like Roger Ebert who describes Bordwell as “our best writer on the cinema” (see Dargis 2010) but also from a new generation of netizens including film and television studies students. Minding Movies provides as good a place as any from which to think about the new priorities of film criticism and review. I have always felt that B&T represented one way to be with films and the film world. On the evidence of Minding Movies it is a way of life in films, a life spent with films, a life in the scholarship of films from Carl Theodor Dreyer to the Classical Hollywood Cinema from Hong Kong to the poetics of cinema; from film history to the history of film style. B&T embody a particular persona of the critic committed to art in film and to the cinema and its art worlds. Minding Movies specifies this persona indicating what a commodious place it provides and its scope for research and particular kinds of possibility. Roland Barthes, Mythologies. Translation Annette Lavers (London: Granada, 1973). David Bordwell and Kristin Thompson, Minding Movies: Observations on the Art, Craft, and Business of Filmmaking (Chicago: University of Chicago Press, 2011). Noël Carroll, On Criticism (London: Routledge, 2009). Alex Clayton and Andrew Klevan, The Language and Style of Film Criticism (London: Routledge, 2011). Ian Hacking, The Social Construction of What? (Cambridge, Mass. : Harvard University Press, 1999). Ian Hunter, “The History of Theory”, Critical Inquiry, v. 33, n. 1 (2006), pp. 78-112.